CB26 provides is the base part of our two-board system of mounting connectors available only in right angle format. This board provides two 68-pin 2 mm headers designed to mate with CB26A through CB26T plugboards (sold separately). Up to two plugboards may be attached simultaneously and are held in place with right-angle brackets. Each plugboard supports right angle connectors that cannot be obtained in vertical-mount format. Set of two boards. CB26A offers two Cisco-style 26-pin Smart Serial connectors. The connectors may be used independently or together for a two-ended cable. An aluminum hold-down bracket clamps the small, fragile Smart Serial connector to the board for extra support when testing long or stiff cables. Requires the CB26 Small Frame Motherboard (Item 756) for operation. Set of two boards. Photo shows CB26 (black) with the CB26A (green) plugged into the first slot. The second slot is available for another plugboard. CB26B offers two 0.8mm VHDCI connectors, one of 50 pins and the other of 68 pins. An expander cable comes with this board to bring extra test points to the board for the 68-pin connector. Needs the M2 or M3 tester; will not work with M2-Basic (insufficient test points). Requires the CB26 Small Frame Motherboard (Item 756) for operation. Set of two boards. Photo shows CB26 (black) with the CB26B (green) plugged into the second slot. The first slot is available for another plugboard. See close-up of connectors below it. CB26C (shown below) supports four sizes of modular plugs. The 4-position 4-conductor mates with handset cords, a 6-position 6-conductor jack mates with RJ11 and RJ12 cables, a shielded 8-position 8-conductor jack accepts RJ45 cables, and a shielded 10-position 10-conductor jack accepts RJ48 cables. The connectors may be used independently or together for a multi-ended cable. Requires the CB26 Small Frame Motherboard (Item 756) for operation. Set of two boards. Photo shows CB26 (black) with the CB26C (green) plugged into the first slot. The second slot is available for another plugboard. CB26D accepts the Firewire 1394b connector (9 pins plus two shields), the USB miniB connector (5 pins plus shield), and the Serial ATA connector (7 conductors). Two Serial ATA connectors are provided and may be used simultaneously for multi-headed cables. Requires the CB26 Small Frame Motherboard (Item 756) for operation. Set of two boards. Photo shows CB26 (black) with the CB26D (green) plugged into the first slot. The second slot is available for another plugboard. See close-up of connectors below it. CB26E offers two independent HDMI connectors (19 pins plus shield). These connectors may be used simultaneously for multi-headed cables. Requires the CB26 Small Frame Motherboard (Item 756) for operation. Set of two boards. Photo shows CB26 (black) with the CB26E (green) plugged into the first slot. The second slot is available for another plugboard. See close-up of connectors below it. CB26F accepts the InfiniBand connector (25 pins plus shield). Two independent connectors are provided and may be used simultaneously for multi-headed cables. Requires the CB26 Small Frame Motherboard (Item 756) for operation. Set of two boards. Photo shows CB26 (black) with the CB26F (green) plugged into the first slot. The second slot is available for another plugboard. See close-up of connectors below it. CB26G accepts the 4-, 8-, and 16-pin Shielded Data Link™ connectors used in data, communications, and medical applications. Connectors not included! Customer-provided connectors installed without charge. Requires the CB26 Small Frame Motherboard (Item 756) for operation. Set of two boards. Photo shows connector drawing (photo not available). CB26H accepts the 36-pin external and 26-pin internal iPass connectors. The internal connectors mounts along the short edge of the board. Connectors not included! Customer-provided connectors installed without charge. Requires the CB26 Small Frame Motherboard (Item 756) for operation (see previous page). Set of two boards. Photo shows CB26 (black) with the CB26H (green) plugged into the first slot. The second slot is available for another plugboard. See close-up of connectors below it. CB26i accepts four independent SATA connectors. All four connectors may be simultaneously connected for dual or quad cables. Requires the CB26 Small Frame Motherboard (Item 756) for operation. Set of two boards. CB26K accepts two Displayport connectors. Connectors not included! Customer-provided connectors installed without charge. Requires the CB26 Small Frame Motherboard (Item 756) for operation. Set of two boards. Photo shows CB26 (black) with the CB26K (green) plugged into the first slot. The second slot is available for another plugboard. See close-up of connectors below it. 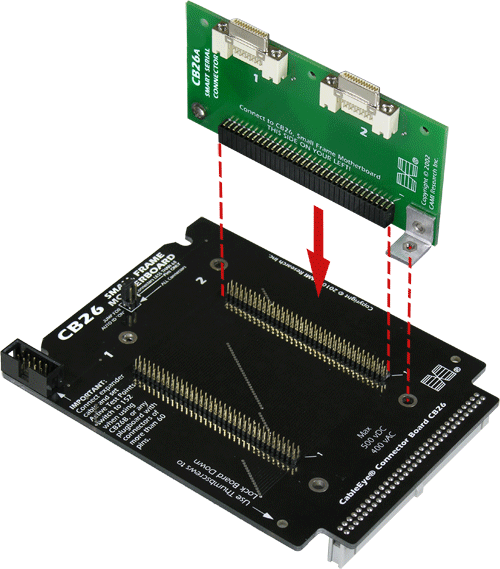 CB26L accepts 9-, 15-, and 25-pin MicroD Female connectors. See CB41-44 for the full range of Micro D sizes and genders. Requires the CB26 Small Frame Motherboard (Item 756) for operation. Set of two boards. Photo shows CB26 (black) with the CB26L (green) plugged into the first slot. The second slot is available for another plugboard. See close-up of connectors below it. 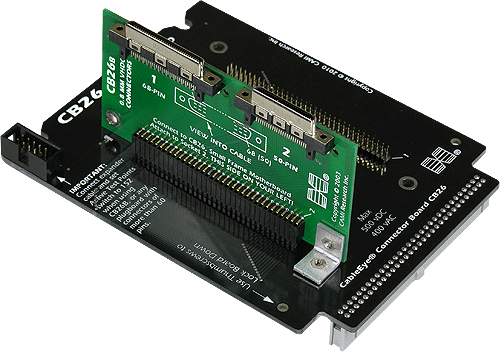 CB26N accepts USB 3.0 Types A, B, and Micro A/B connectors. The Micro A/B connector accepts both USB 2.0 Micro A and Micro B connectors. Requires the CB26 Small Frame Motherboard (Item 756) for operation. Set of two boards. Photo shows CB26 (black) with the CB26N (green) plugged into the first slot. The second slot is available for another plugboard. See close-up of connectors below it. CB26T accepts 2 Mini HDMI and 2 Mini Display-Port connectors. Requires the CB26 Small Frame Motherboard (Item 756) for operation. Set of two boards. Photo shows CB26 (black) with the CB26T (green) plugged into the first slot. The second slot is available for another plugboard. See close-up of connectors below it. CB26U accepts 2 USB C-Type Connectors that can be use simultaneously. Requires the CB26 Small Frame Motherboard (Item 756) for operation. Set of two boards. Requires Software Version 5.5 or later. Photo shows CB26 (black) with the CB26U (green) plugged into the first slot. The second slot is available for another plugboard. See close-up of connectors below it. 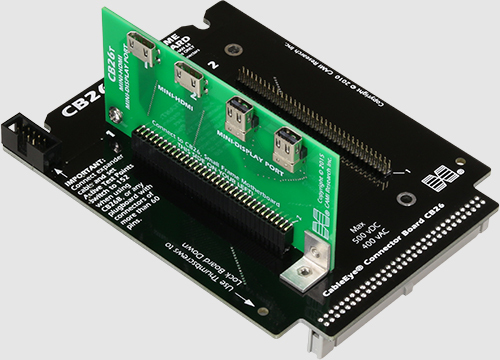 CB26V accepts 2 FI-X 30-pin connectors that can be use simultaneously. Requires the CB26 Small Frame Motherboard (Item 756) for operation. Set of two boards. Requires Software Version 5.5 or later. Photo shows CB26 (black) with the CB26V (green) plugged into the first slot. The second slot is available for another plugboard. See close-up of connectors below it.